If you’re looking to start your own business, there are many opportunities and options out there, but I’ve found property preservation to be a lucrative, reliable, and excellent business to be in. I have years of experience in property preservation, and highly recommend becoming a part of it. Beginning as a Property Preservation Vendor is usually the best way to get a foot in the door, followed by the creation of your own property preservation business. In the following article, we’ll take a look at the ins and outs of the property preservation business, and give you a good idea of whether it’s a business you’d like to be in. Read on! Property preservation is the process of caring for the inside and outside of a foreclosed property, be it vacant or occupied. Property preservation businesses work with banks and asset management companies to provide services such as repair, inspection, insurance claim management, and maintenance. Property preservation is also called “mortgage field services,” and getting involved with completing REO rehabs and property preservation repairs directly for national servicing companies will help your business succeed. Another great option is to work as a subcontractor for a company who also works with national servicing companies. In order to do this, you should become a Property Preservation Repair Vendor or an REO (real estate owned) Repair Vendor. These properties are usually bank-owned properties that have been seized by the banks or lenders from residents who were unable to pay their mortgages. The banks or lending agencies were counting on the interest on the loans for their own revenue, and so must salvage their investments when homeowners deon their loans or can’t pay their mortgages. Their first move is to try and sell the properties at foreclosure auctions. How Can I Learn About Property Preservation? And that’s just the beginning. There is a lot to learn, but you can do it – and if you want a stable, reliable business for many years to come, you should start right away. How Can I Become a Property Preservation Repair Vendor? Most people get into the property preservation business as a Property Preservation Vendor, and then move up to create their own businesses which employ other Property Preservation Vendors in turn. By creating your own business down the line, you are helping others who want to succeed in this industry, as well. One of the first steps to becoming a Property Preservation Vendor (or PP Vendor) is to sign up with some of the nation’s leading National Property Preservation companies as a Repair Vendor. DO NOT SIGN UP AS A MAINTENANCE VENDOR – that is an entirely different position. Certification tests are based on these courses, and you can take whichever courses you need for your business. Once you complete the courses, your business’ information will be put into the NAMFS Membership Directory and you will receive an ID card with a photo and a QR code to verify your qualification. The courses cost anywhere from $240 to $330 for non-NAMFS members; you can get a discount code if you become a member. 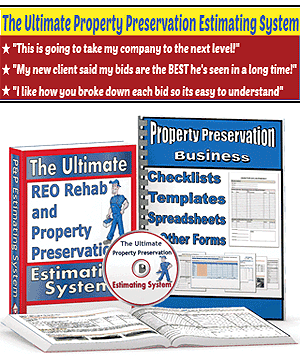 How Can I Start a Property Preservation Business? Once you’ve educated yourself about the property preservation business enough that you know what you’re doing, it’s time to find a few companies in your state, and fill out their online vendor applications. We have a comprehensive list of Property Preservation companies listed on our site. Keep in mind that banks are serious businesses – you want your company to appear steady and reliable, so take all the usual precautions and they will want to work with you. You have to register online with the banks and other companies as they will not work with companies who have not. US Best Repair Service, Inc. There are many more of these companies, and you can apply as a PP Vendor with online applications on my website here (just scroll down to the “List of Other Property Preservation Companies With Links”). How Can I Become a Property Preservation Business with Banks? Now that you know you want to be a part of this lucrative business, and once you’ve established yourself as a Property Preservation Vendor (PPV) in your area, the next move is to start your own business. The best position for a property preservation business to be in is connected with banks. Banks will pay people to take care of foreclosed properties, which no one else is usually caring for. Even if the original homeowners are still in the property, they may not be caring for it, and the bank needs businesses to do this – otherwise, the property may be difficult to resell in the future. This is where your property preservation company comes in. In order to get this work from banks, your company will have to actively market itself to the banks and the local property preservation companies in your state or area. This requires that your company and employees have all the skills and licenses necessary to perform property preservation – so make sure you get those. In general, if you have more skills and more licenses stating that your are qualified to perform those skills, banks will be more interested in you, and send more work your way. If you’re not comfortable calling people or speaking to them about your business, get comfortable. Some of the best recommendations in this business can come from word-of-mouth. If you’re already in the construction or repair business, you probably have some connections that can help you get started; if not, the banks and property preservation companies in your area can help you get started. This extra attention to detail will be rewarded when you are selected for the job. HUD handles property preservation for properties that have been foreclosed on and will soon be foreclosed on – they also handle the property inspections, renovation permit, and access restrictions that they will pass on to you if you work with them. Always keep in mind while you are performing your work that part of your job is to make the properties look attractive to prospective buyers once the bank or management company is ready to resell them. Some people call this “curb-appeal,” and its a basic tenet of this business. In general, $5,000 is the Maximum Property Preservation Allowance, and you can find more information about HUD homes that may need property preservation care here. While it’s true that many small property preservation businesses have a hard time getting off the ground and staying afloat, my best advice to you is to treat your business like your lifeblood, not like your side job. When you start a business, you want it to succeed, so it should be one of the most important things in your life. Don’t give up just because the going gets rough, and always provide the absolute best service to your clients and companies that you are capable of. Complete the work the way you were asked to, and take photos or write down issues you have for proof later. Remember, your clients need you, and your business will provide years of stability if you run it correctly. 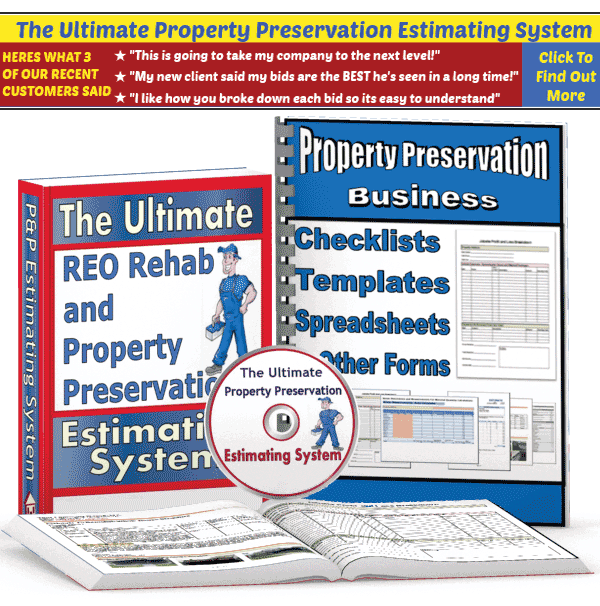 I hope this information has given you a basic overview of the property preservation industry and what your role or the role of your new business will be within it. I’ve tried to provide as many resources for information here as I can. This is an excellent business to be in, and can help you become an independent business owner, while making a great living. Here’s hoping your business will be as successful as mine, and that you now have to tools to establish it and keep it running smoothly for years. Now proceed to read other Property Preservation Education and Training Articles! If you start a PP business and you have employees under you, do those employees need to be certified also? Very good information i want to start this kind of business but i have know idea where to start or where to get the capital should i apply for a small business loan what is the cost for starting this business?